From November 8, Turkish Airlines will launch flights from the new Istanbul airport in Baku and in reverse at discounted prices. The first flight to Baku from the new airport in Istanbul will take place on November 1, 2018 at 15:55 (GMT + 3). The return flight from Baku to the new airport in Istanbul will take place on November 2 of this year at 08:53 (GMT + 3). Until December 29, 2018 Turkish Airlines will launch a limited number of domestic and international flights from the New Istanbul Airport, as well as continue the main flow of work and flights on the existing schedule without changes at Ataturk Airport in Istanbul. 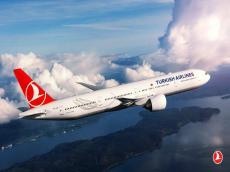 First of all, from the New Istanbul Airport, Turkish Airlines will start flights to Ankara, Antalya, Izmir, Azerbaijan (Baku) and the Turkish Republic of Northern Cyprus (Ercan). Flights from Istanbul New Airport will be considered additional. Flights that are already operated from Ataturk Airport in Istanbul to Ankara, Antalya, Izmir, Azerbaijan (Baku) and the Turkish Republic of Northern Cyprus (Ercan) will be operated in accordance with the existing schedule until December 30, 2018. The transfer from Ataturk Airport in Istanbul to the New Istanbul Airport will take place on December 31, 2018. All flights currently operating at Ataturk Airport in Istanbul will be transferred to the New Istanbul Airport. Discount prices for flights from Istanbul New Airport (airport code - ISL) to Baku and in the opposite direction, which will be carried out daily from November 8 of this year, the minimum ticket price for an Istanbul-Baku-Istanbul flight with an online purchase will be 82 euros ( about 164 AZN), and in the opposite direction 109 euros (about 218 AZN). Flights from Istanbul to Baku will be operated daily at 09:25 local time (arrival in Baku - 13:15), and back at 14:10 (arrival in Istanbul - 16:30). The ticket price includes 30 kg of luggage and 8 kg of hand luggage. Flights from New Istanbul Airport to Baku will be operated in parallel with other flights of companies from other Istanbul airports - Ataturk and Sabiha Gokcen, which will be carried out according to the usual schedule. In addition, there were no changes in the flight schedule for transit flights (to Europe, Asia, America, etc.) from these airports. Turkish Airlines, founded in 1933 and having at that time a fleet of five aircraft, is currently a member of the international alliance Star Alliance and a 4-star airline with a fleet of 325 (passenger and cargo) aircraft flying along 304 destinations worldwide, including 255 international and 49 domestic.